Women empowerment takes various forms, for the women of the Butibam village of Morobe Province, it is involving women to sew and engage in money making activities. The local women from the village and neighboring communities recently graduated from a Mindset and Leadership skills training which was funded by the Member for Lae Loujaya Kouza aimed at empowering women with the skills of sewing, baking, floriculture, jam making and other skills that they can be able to use to generate an income for themselves. Business plans to utilize the skills of the local women, especially in sewing and floriculture is in the pipeline said local business woman and President of Ahi Council of Women Ms. Carol Ahi. “We want a lot of mothers to sew so we can venture into the cities because we believe that the “ambaseleng” has a demand. We are encouraging the mothers because after the training we need to see some productive answers coming out from the sewing class, so that we can at least buy from the mothers and supply,” said Ms. Ahi. She said the “ambaseleng,” better known to many as the “mission kolos”, is currently on high demand in Lae city to which the local demand has to be met before they can venture out. Ms. Ahi further added that both quality and quantity will be a priority in making it work. Ms. Ahi revealed that plans of establishing and registering the Butibam Tailoring Company is nearing, which will provide employment opportunities for the local women. “My aim and goal is to see quality products of the ambaseleng coming out from my village, we are really empowering the women and to have more than 100 women sewing is excellent. 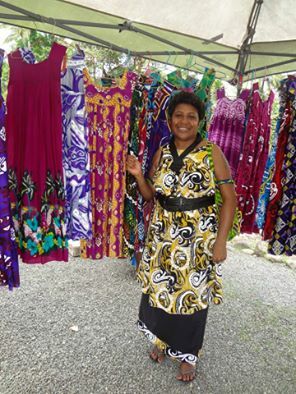 I believe that in the future we are going to hit the Lae market and venture into the business and business will improve,” she said.